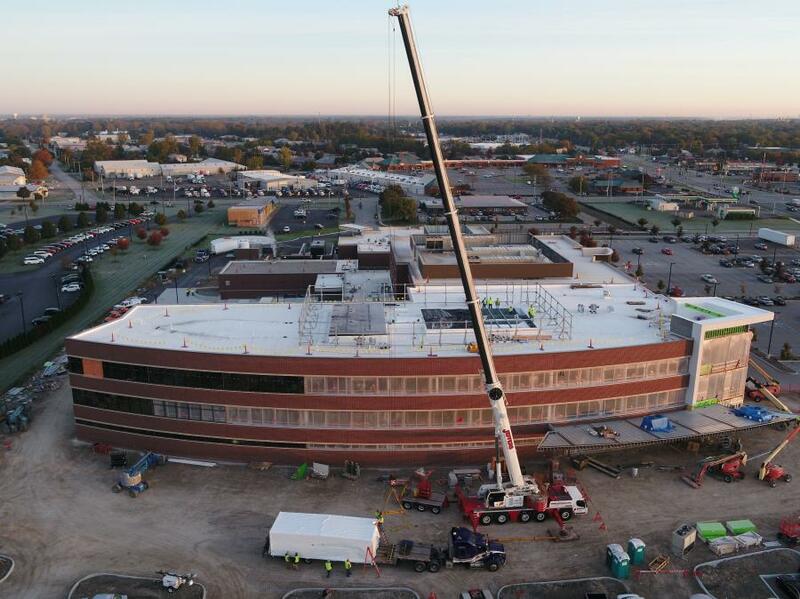 Rudolph Libbe Inc. of the Rudolph Libbe Group is just weeks away from delivering the third and final phase of the Mercy Health–Perrysburg Hospital in Perrysburg, Ohio, a city in the Greater Toledo area. The completed hospital will give residents of Wood and Lucas counties a comprehensive array of medical services close to home. Mercy Health is investing $64.4 million into its Perrysburg campus at 12623 Eckel Junction Road, a remote location of the Mercy Health–St. Vincent Medical Center LLC in Toledo. Mercy Health established its presence in Perrysburg with the opening of the $13.2 million Phase 1 emergency department and diagnostic center in November 2013, followed by the $14.3 million Phase 2 Perrysburg Cancer Center, which opened in November 2016. The new addition is part of Mercy's Phase 3 plan, which was approved by the hospital board in April 2017. Bon Secours Mercy Health provided the capital funding for the project. Phase 3, which will cost $36.9 million, has Rudolph Libbe Inc. performing some of the work and serving as the construction manager at risk. 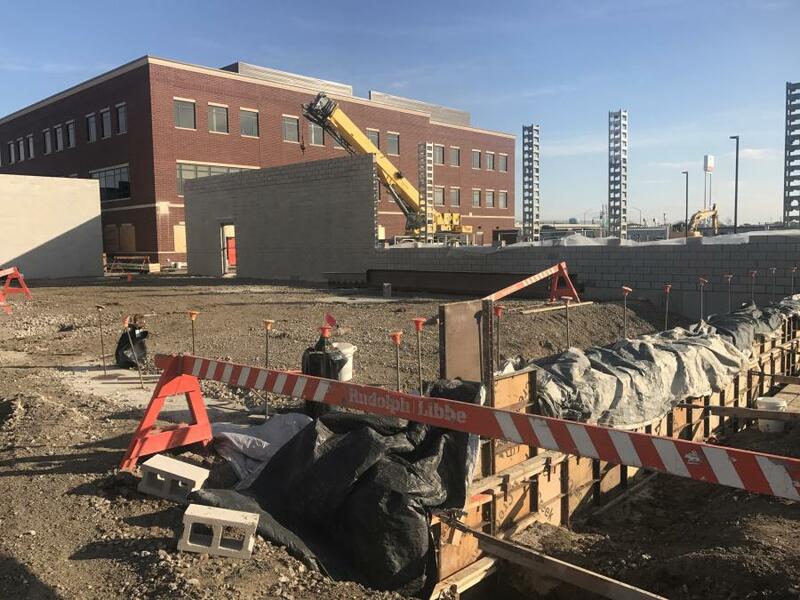 This phase will see the erection of a three-story tower with 46 in-patient beds, five operating rooms, one procedure room, medical office space for physicians, and support areas. The new 101,000-sq.-ft. building, with a 44,500-sq.-ft. footprint, is attached to the cancer center and the emergency department. 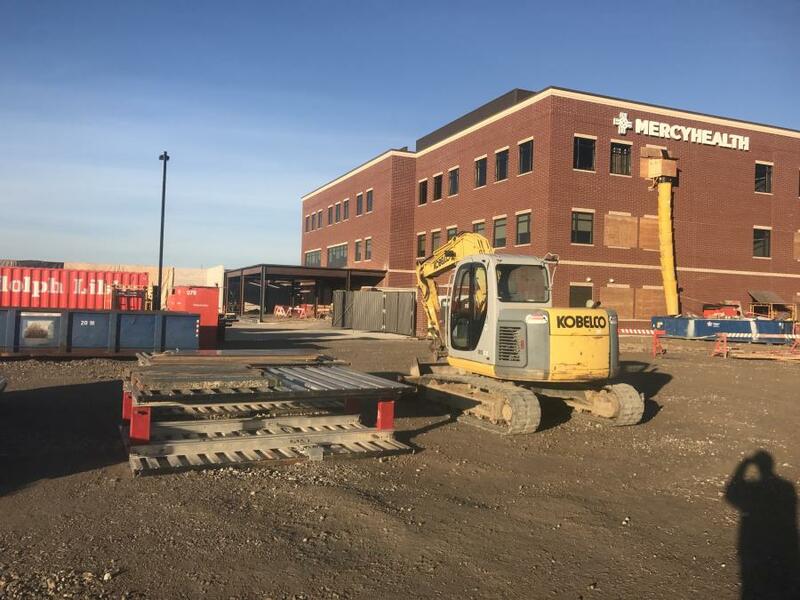 Phase 3 construction began in July 2017, and Mercy plans to open the doors to patients in April. "Perrysburg is a growing community, and Mercy Health is expanding its clinical network to provide residents with convenient access to services," said Bob Baxter, president, Mercy Health–Toledo. "The health care industry is following trends in other industries for consumers to have ready access to services and products, and Mercy Health's addition of services is consistent with these trends and consumer demand for easy access to care close to home. Historically, residents in the Perrysburg area have had to travel for access to services." "The new addition will be used to expand Mercy Health's inpatient and outpatient care capabilities," said Michael Craig, COO, Mercy Health–Perrysburg Hospital. "It will include an outpatient pharmacy, surgery center and medical office space. This will allow Mercy Health to offer certain specialty care to the Perrysburg community without residents having to leave Perrysburg. The expansion also will bring additional resources to complement our Emergency Department and provide a higher level of care. "The project is responding to physicians seeking to expand their practices in the Perrysburg area and having ready access to hospital, emergency and diagnostic services needed by their patients," he added. "With these phases of development, Mercy Health is positioned to become the health care provider of choice for the Perrysburg area, elevating our presence and visibility in the community while increasing the needed access to care. "The signature campus being created will be a full-service destination center for patients seeking inpatient care, surgical intervention, emergency services, cancer care and physician and outpatient diagnostic services." The master plan for the campus allows for future expansion. A new structure connected to the Phase 3 medical building can be added in the future based on community needs for additional services. A new addition would allow for additional medical office space, surgery capacity, beds, procedural services and other services, and support space. "The project will adjoin the existing cancer center and emergency department, said Tom Schneider, senior preconstruction leader, Rudolph Libbe Inc. "The project includes a third-floor build-out of the cancer center. The cancer center build-out was completed in the spring of 2018 with the new tower slated to open in the spring." Cincinnati-based Champlain Architects designed the new tower, which, although not a LEED building, includes many LEED features, such LED lighting throughout for energy efficiency. Phase 1 first floor and third floor work for the tower were completed April 2018. The balance of project will be complete in the spring or summer. Fitting the new hospital on an existing site that is operational and has limited parking was a challenge, Schneider said, although, he added, he had sufficient time to plan the schedule, as planning for Phase 3 took place while Phase 2 of the project was under way. "ICRA standards are being followed to control noise and dust with the existing facility," he said. 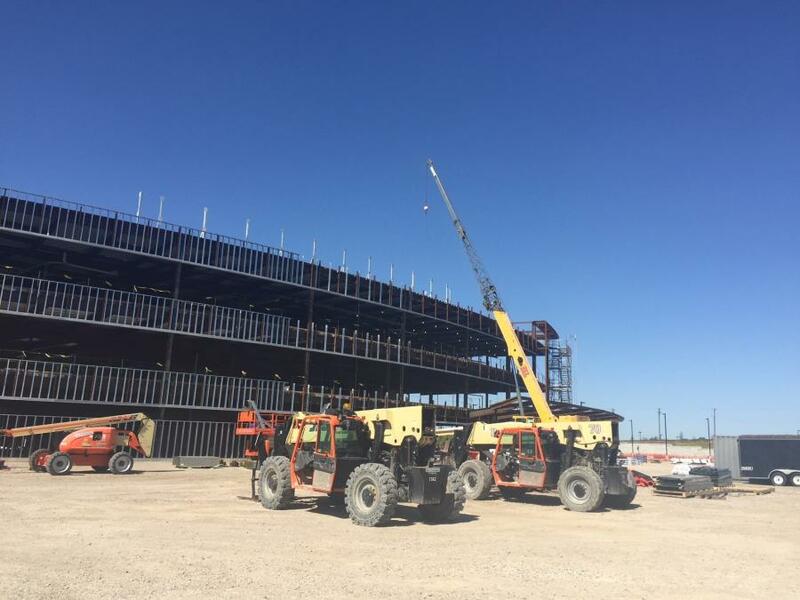 "Site logistics, material laydown areas, noise and dust control are some of the challenges of putting up the new building adjacent to the existing one. This project has been a team effort with all members participating in design and construction decisions." The foundation for the basement floor, performed by Rudolph Libbe, took approximately six weeks to complete. "We installed standard spread footing," said Schneider. "There were no challenges." There were no rock or earth removal operations at site or for the other projects. The floors, based on steel beams, were placed on a slab deck with a crane employed to erect the structural steel. "We enclosed the tower in late summer," said Schneider. "The glazing was installed after exterior finishes completed. There was no temporary closure except for the glazing areas. Brick was installed over metal studs, sheathing, and an air barrier." The roof took approximately six weeks to complete, and HVAC units have been placed on it. The interior work is scheduled for completion this spring for the electrical, plumbing, HVAC and finishes. "We do a general cleanup on a daily basis," said Schneider, "and we'll do a final one to meet hospital standards at end of project. Weekly progress meetings with subcontractors are held to make sure we stay on schedule." Peak days have had 70 construction workers on site. Rudolph Libbe employed its own craftspeople to perform site work, concrete, masonry and carpentry. GEM Inc., based in Walbridge, performed the steel erection. Tech Dynamics, based in Perrysburg, was the steel supplier. Lakeside Interior Contractors, based in Perrysburg, performed metal studs, drywall, and painting. Commercial Flooring of Toledo performed flooring. Nordmann Roofing, based in Toledo, performed roofing. Thyssenkrupp, based in Northwood, performed elevator work. Accel Fire Systems, based in Sylvania, did the building fire protection. Dunbar Mechanical, based in Toledo, performed the plumbing. VM Systems, based in Toledo, performed the HVAC work. and Lake Erie Electric, based in Bowling Green, performed the electric and technology work. The new tower contains 2,200 cu. yds. of concrete, 450 tons of steel and other standard materials. On this project Rudolph Libbe used Komatsu PC138 and PC228 excavators; Cat D5G XL D and Cat D6N XL dozers, each with a Trimble GPS system; Cat 259D and Bobcat T590 compact track loaders; Gradall 544D and a JLG 1055 telehandler; and an Ingersoll Rand SD105 DX smooth roller. The company also rented a Mustang 800Z mini-excavator from Buck & Knobby in Ottawa Lake, Mich.; a Komatsu PC238 excavator from Columbus Equipment in Perrysburg; a JLG 1055 telehandler and a JLG 943 telehandler from Skyworks in Toledo; and a Bobcat T590 compact track loader from Bobcat of Toledo. Also rented from Skyworks was a John Deere 410SJ backhoe. Columber Equipment supplied a Komatsu WA320 loader and a Komatsu PC88 mini-excavator. Buck & Knobby supplied a Dynapac 66-in. smooth-drum roller, and Yanmar 17, 80, 75, and 45 mini-excavators. A Liebherr truck-mounted crane, from Jeffers Crane, with a 197-ft. boom was used to place rooftop units. Rudolph Libbe dealt with any equipment repair and maintenance issues quickly to ensure that work progressed on schedule. 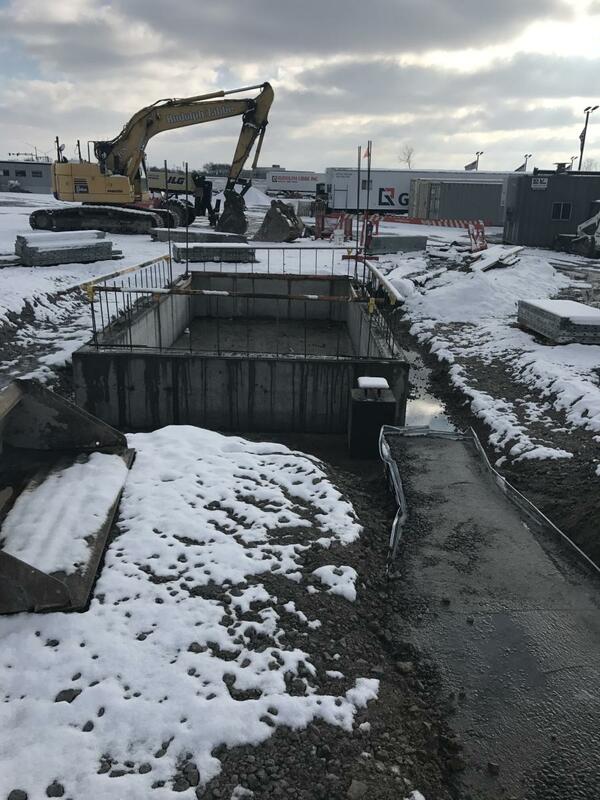 Routine maintenance was completed as scheduled, either by the equipment dealers, subcontractors or Rudolph Libbe — and all mechanics armed with knowledge of the work site and the conditions the equipment would encounter in all seasons.